Bullz-Eye had the opportunity to pose questions to Nissan Senior Vice President José Muñoz from our editors and readers at the New York Auto Show. WE got a great response, and Nissan Product Specialist Caroline Oberst was on hand to relay the questions submitted on this blog and by Twitter to Mr. Muñoz. 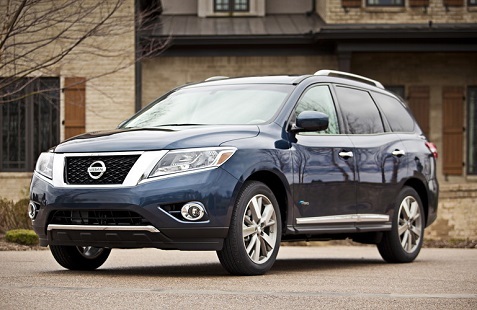 The questions covered a wide variety of vehicles and topics, including new hybrids like the 2014 Pathfinder pictured in the first photo above and sales of the Nissan Leaf. We’ve been very impressed with Nissan’s new vehicles, so if you’re in the market or want to learn more about upcoming models, check out the interview below. We recently attended the New York Auto Show as guests of AutoWeek and had a great time. AutoWeek’s Wes Raynal gave us a tour of the show, and we were joined by John Raho, one of AutoWeek’s readers. Having an expert like Wes on the tour along with a knowledgeable car buff like John made the experience very fun and informative. These are exciting times in the auto industry, as all of the major brands, including the U.S. automakers, are putting out excellent products. Check out our car channel for new car reviews every week. Also, if you’re a car enthusiast, check out the reviews and other car features at AutoWeek as well.